What are the distinctive dimensions and drivers of innovative Māori leadership and integrated decision making, and how do these characteristics deliver pluralistic outcomes that advance transformative and prosperous Māori economies of wellbeing? A diverse range of Māori leadership practices have contributed to the development of a Māori economy with a current estimated asset base of $42.6 billion, yet the role of mātauranga and tikanga Māori within leadership practices is poorly understood. While economic success may in part be attributed to Māori leadership philosophies and practices that have had to adapt and adjust to changing contexts, it remains poorly understood. Thus the significance of this research project lies in developing a comprehensive understanding of if and how Māori leaders generate, embody and enact leadership to make decisions to advance prosperous and sustainable Māori economies of wellbeing. This project is considered crucial, as leadership and decision-making for Māori and Indigenous peoples occurs within a diverse range of organisational and governance contexts. In the Māori economy, this includes iwi, hapū, marae, not-for-profits, public sector, political, religious and educational organisations, amongst many others. 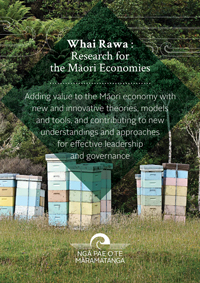 The core aim is to advance the research knowledge of Māori leadership and decision-making whilst promoting transformative strategies that will assist Māori organisations and their leaders to build further prosperous Māori economies of wellbeing. Develop a better understanding of tikanga Māori for business to help explain and inform new ways of strategising “being and doing” Māori leadership. Better understand the dynamics of Māori leadership and decision-making. Identify the critical requirements for effective leadership of Māori organisations that will lead to enhancing the economic performance of Māori communities while maintaining consistency with mātauranga and tikanga Māori.